This is the thread on NeoGAF that Matt Matthews posts to accompany his NPD analysis feature on Gamastura. It’s equally as fascinating. This monthly feature on Gamasutra is fascinating even if you’re not an NPD armchair analyst. I know I always inadvertently get sucked into reading this even if I have better (or more important) things to do at that moment. Even though I had read about ‘tower defense’ games and I had meant to play Desktop Tower Defense but I never did. When Final Fantasy: Crystal Defenders came out on consoles last week I gave it a trial run with the demo. I was instantly hooked, it’s all relatively simple, but the whole “how far can you get” part is diabolically addicting. Four of the four made so far. Sega Genesis controller. Third in a series of four so far. This one is of the Super Nintendo controller. Second in a series of four, so far at least. This one is of a PlayStation controller. One of currently four pin designs that “commemorates” the console wars. This one is of a NES controller. I kind of want just because it’s so amusing, although they have to be shipped from Greece. After three weeks of getting up early for naught, I finally was able to wake up and record a podcast. Since you’re back for more, you’ll find that this episode of the XABY Radio podcast, Nayan, Josh, Eric, Segata and I discuss our recent game purchases, what we’re playing and we discuss interesting Christmas and/or gift giving stories, to keep with the holiday season. We also talked at length about Chrono Trigger and Chrono Cross, although I remained largely silent for that entire conversation because I haven’t ever played either of those games. Although with Chrono Trigger out on the Nintendo DS, I will definitely be playing some of that game in the near future. I also talk a bit about my recent near-completion of the Mirror’s Edge campaign. Since the podcast was recorded, I finished Mirror’s Edge and, after I try out a few of the time trial and speedrun levels, I know I have quite a bit more to say about the game. I just needed some more time to ruminate about it and I didn’t finish the game before the podcast like I had wanted to. Don’t forget to listen nearly all the way to the end where I talk about my dad taking out pimps (in Grand Theft Auto III). Last week I wrote about Tony Hawk’s Project 8 when I had read about the “Nail the Trick” feature in the upcoming game in OXM. 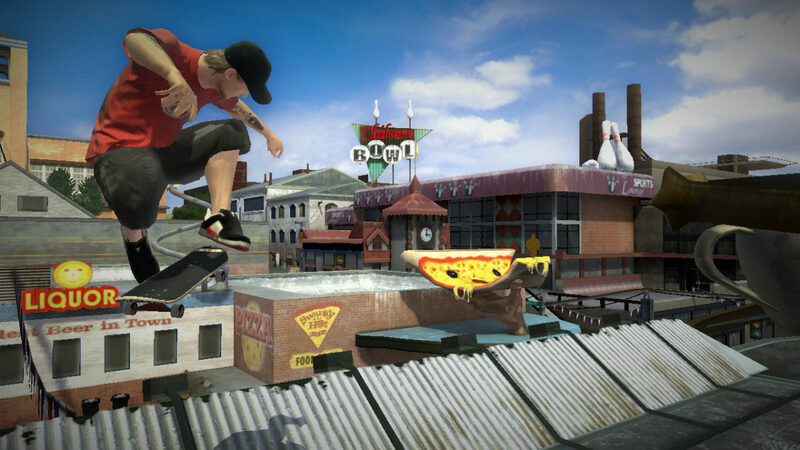 By the end of the week Activision and Neversoft released a video tutorial for “Nail the Trick” narrated by Rodney Mullen. I was already sold by the time I read the article, but this video made made it so I cannot cannot wait for the game to be released. A weekly summary of what is being talked about quite a bit in the gaming community. This week Microsoft released another sizable backwards compatibility update, which comes hot on the heels of yet another thread on NeoGAF pondering the current state and future of Xbox 360 backwards compatibility. The update was forty-eight games and now adds some other titles I just have to pick up like Fatal Frame 2: Crimson Butterfly and rare US-release of Sneakers — yeah, don’t poke fun, thanks. On top of that, this most recent update blew a long-running conspiracy theory floating around about Xbox 360 BC on NeoGAF and other message boards out of the water. This theory was that Microsoft would not release the backwards compatibility option for either an Xbox game that hasn’t been released yet or an Xbox game that also had an Xbox 360 version or both of these. With the inclusion of Lego Star Wars II: The Original Trilogy both of these theories have been disproved. Spyhunter: Nowhere to Run and The Legend of Spyro: A New Beginning further adds weight to disproving the theory, something the Gamerscore blog also points out. Message board poster and PS3 fanboy reveals unknown information, how much of it is true? Hands down,the fastest growing thread on NeoGAF last week was easily this one posted by typhonsentra, where he quoted an excerpt from a thread titled “PS Questions Answered! 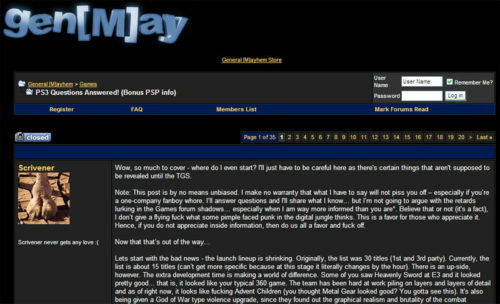 (Bonus PSP info)” on the General [M]ayhem message board. Many think the Scrivener is an insider, possibly at a Sony first-party developer even, not only based on his information — which would be dismissed would it come from someone else — but because he proved some point by previously mentioning an upcoming PSP bundle and detailing it’s contents including UMD movie titles perfectly. Among other things, Scrivener mentioned that Resistance: Fall of Man currently stands over 20 GB in size, days before the MTV feature on that very title came out. This has made many people believe, beyond the obvious hyperbole when describing some of the games, that he is not only legit, but feeding out information which will come true in time and doing so very deliberately. He even states in the lengthy General [M]ayhem thread that he got approval before posting any information, which did bring up some questions as to what he aims to do. Apart from all of that, there is no doubt some of what Scrivener says is true, some of it is clearly (fanboy-ish) enthusiasm and some of it is pure speculation (such as the possibility of a 4x Blu-ray drive instead of the announced 2x drive). No matter what anyone thought about him and his information, nobody could stop talking about him and the thread saw all manner of defensive statements, damage control by the opposite side and jokes. Time will tell just how much was frenzied hyperbole and how much was wishful thinking. I have no doubt someone on NeoGAF saved that thread to bring up at a later date to compare. This week, Ubisoft announced that Assassin’s Creed would be released on the Xbox 360, confirming it as a multi-platform title after revealing it would be PC bound earlier in the week. Since E3 2006 and based on Ubisoft’s statements that Assassin’s Creed was only announced for PLAYSTATION 3, many inferred that the title would be exclusive to Sony’s console. On top of that, Assassin’s Creed picked up a lot of hype at E3 based on the excellent trailer released at E3 (embedded below) and closed doors presentations to the press, seemingly strengthening Sony’s third-party stable. Discussion started over on NeoGAF around 7:00 PM Pacific when Zonar spotted that IGN had updated their Xbox 360 landing page feature graphic with the Assassin’s Creed news. It was taken down within an hour and speculation ran rife on when the announcement would be official, if the different platforms would get the game at the same time and what reasons and motiviation may be behind the marketing. Luke over at 1Up posted that the October issue of Electronic Gaming Monthly would also confirm the announcement, but that the feature would not answer a lot of these very questions that the guys over at 1Up and EGM were wondering too. Seems those questions will go unanswered for now as the lists for third-party exclusives for any console dwindle by one. At least this great looking title has the chance to be played by larger group of people than if it had stayed exclusive, from what little I’ve seen, Assassin’s Creed deserves it.